From bestselling author Max Brooks, the riveting story of the highly decorated, barrier-breaking, historic black regiment—the Harlem HellfightersTHE HARLEM HELLFIGHTERS is a fictionalized account of the 369th Infantry Regiment—the first African American regiment mustered to fight in World War I. From the enlistment lines in Harlem to the training camp at Spartanburg, South Carolina, to the trenches in France, bestselling author Max Brooks tells the thrilling story of the heroic journey that these soldiers undertook for a chance to fight for America. Despite extraordinary struggles and discrimination, the 369th became one of the most successful—and least celebrated—regiments of the war. The Harlem Hellfighters, as their enemies named them, spent longer than any other American unit in combat and displayed extraordinary valor on the battlefield. Based on true events and featuring artwork from acclaimed illustrator Caanan White, these pages deliver an action-packed and powerful story of courage, honor, and heart. World War One or the Great War as it used to be known, is a time in our history that has been so overshadowed by the wars of today and World War II that many Americans cannot name a single battle. While the Battle of the Bulge, Fallujah, and Operation Anaconda are talked about in history classes throughout the world the Battle of Somme and the Battle of Liege fade away from our memories. It’s even a little known fact that Veteran’s Day began as Armistice Day commemorating the ending of World War One, which is why it is celebrated on November 11th. 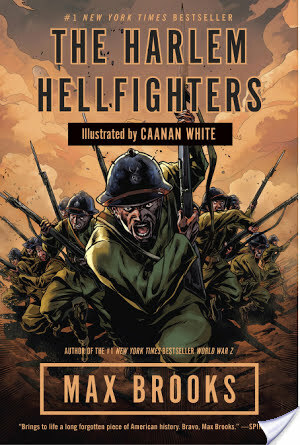 Enter Max Brooks and his graphic novel The Harlem Hellfighters. First let me begin by explaining that I have been collecting and reading comic books for about 20 years now. They have had a huge influence on my life. In fact, Superman #120 “To be a Superman!” was probably one of the most influential pieces of literature in my life and impacted my decision to join the Army National Guard and become a Police Officer. So as a member of the New York Army National Guard when I was given the opportunity to read The Harlem Hellfighters, I jumped at the chance. The book is about the 369th Infantry Regiment an all-black unit from the New York Army National Guard. As a Lieutenant in the NY Army National Guard I have heard of the 369th Infantry and seen their names on the walls of countless facilities but I had never heard their story, which as it turns out, is very unfortunate. These great Americans embodied gallantry, valor and selfless service and did it despite gross neglect from the Army. We follow the Hellfighters from enlisting in New York, to training in Spartansburg South Carolina, To the French fronts. The book tackles not only what it was like for black Soldiers in those fiercely racist times but also what it was like for them as Soldiers learning about the cruel reality of war. Max Brooks even takes a moment to show a Soldier in the sick bay suffering from “Shell shock” an early name for what we now know as PTSD. Since the Soldier suffering from shell shock was a way for Brooks to make a reference to his much more familiar field of zombies, it’s unclear if he just wanted to give the readers a nod or if he is really bringing to light the long standing issue of Soldiers returning from battle both physically and mentally broken. This book will make you angry, it will make you proud, and it will force you to look at WWI with new respect. Brooks does a fantastic job of informing readers about the vast accomplishments of the 369th Infantry through detailed and gripping storytelling. Although he admits that many of the characters are fictional or an amalgam of several real Hellfighters, Brooks’ representation of the Harlem Hellfighter’s story is one that will pull you in and leave you wanting to know more about these great American heroes. If you enjoy war stories but the Captain America Theater of War series just doesn’t cut it for you, then this is what you have been looking for. If you are like me then you cannot buy a comic book or a graphic novel without picking it up and doing a quick check of the artwork first. Let’s face it, the art plays an enormous role in the telling of the tale. I have mixed emotions about Caanan White’s artwork in The Harlem Hellfighters. White’s artwork is marvelous and he doesn’t hold back on the gruesome details, which is important in emphasizing what the Hellfighters were going through. It proves difficult not to be distracted by the nuances of his work during the Hellfighter’s encounters with the Germans. I loved the penciling and Keith Williams did an amazing job as the inker which is proven by the depth of the images without relying on a computer to do it for him. So if I loved the artwork so much then why do I have mixed emotions? I wish that Brooks and White had illustrated the novel in color. I have read black and white comic books and graphic novels in the past such as Frank Millar’s Sin City series and Robert Kirkman’s The Walking Dead, both were fantastic, but their black and white style felt different. I think if Brooks had elected to have a colorist the detail and severity of the war would have been more apparent. In the current form the reader really needs to stop and analyze what they are looking at because some of the details are lost in the black and white peripheral. A small complaint for such a stunning work of art. Overall I think that this is a graphic novel that should not be passed up. If you are a fan of great story telling and can appreciate some fine artwork then you will enjoy this graphic novel. Veterans will relate to the uncertainty of war and will understand the hardships that the Hellfighters deal with throughout the story. As a veteran I found it interesting to see the social climate as Brooks describes it and relating it to the quickly advancing social climate of the military today. Readers however, do not have to be veterans to enjoy this story. The tale of the Hellfighters and their amazing accomplishments despite the lack of support, lies and continued prejudice is one that will captivate readers from all walks of life.